The summer is upon us and there is one sure-fire way to beat the intense heat, that’s right, the highly sought-after swimming pool! In-ground swimming pools can be constructed in a few different ways, and come in many different shapes, sizes, colors and with tons of amenities to choose from. When you opt to install additional features to the swimming pool, your customization enhances your experiences and even the smallest addition can make the biggest difference. Depending on the size of the pool and what you want its main function to be, will determine which features are right for you and your family. Whether you want your swimming pool to be the neighborhood magnet for high-energy activity or a relaxing oasis to sip something frosty in tranquility, there are swimming pool features to fit every scenario. Entertaining the masses is not hard to do when you incorporate a diving board or a water slide to the equation! Back in the day, diving boards were the “it” feature, and today they are still very popular! Sticking to smaller scale features like a diving board lends to a clean backyard aesthetic, so you can still have all the fun, with a refined minimalist approach. Get the scoreboards ready, there is bound to be a family competition in the works! If bigger and badder is your cup-of-tea, a water slide is just what you need! Ask any kid who can’t sit still what their favorite part of a swimming pool is, and I guarantee a water slide is on the short list, if not número uno. 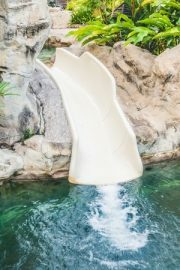 Water slides range in cost depending on the type of slide, its style and how elaborate you want the feature to be. Water slides vary from short, straight shots right into the pool, or they can be more elaborate with twists and turns or even be hidden into a boulder waterfall feature…you name it and it can be built! There are a number of lively water features you can add to a swimming pool area to add to your outdoor enjoyment. Boulder waterfalls always seem to add that little “something extra” to a swimming pool. Being the perfect compliment to free form and standard shaped pools alike, its intended function will portray its adventure. Constructing a full rock wall face begs to be climbed on and jumped off it, while a scaled down feature height will lend to a more relaxing and romantic characteristic. Regardless of your waterfall resembling that of a tropical resort, romantic oasis or family fun zone, we can all agree that waterfalls make for one spectacular backyard focal point! Fountain bubblers are comparable to a domestic version of a mini-geyser in your pool. Typically set off to the corner and built into a pool’s sun ledge, these mini-geysers are a hit with the little ones that can’t swim yet. These features offer moving water that begs to be touched and can entertain the tots for a whole afternoon while you wade right next to them keeping an eye and catching the rays. Deck jets are another great water feature that add to the pleasure of your pool. These jets are installed in the concrete surrounding the pool and shoot solid streams of water from the deck into the water. You can add more drama to these whimsical features by illuminating them with fiber optic light for a beautiful nighttime show! To further customize your pool, don’t forget the fun stuff for adults too! The first thing that comes to mind when thinking about adult-focused water features would be a swim-up bar area. Swim-up bars are typically built with underwater seating and are a great choice for those who like to entertain in the warmer weather. Usually swim-up bars are placed at the edge of the pool and built in conjunction with a sunken patio bar or connected to the outdoor kitchen area. This allows for easy drink and snack access, all while being able to chat with the bartender or those who didn’t bring their swimsuits. 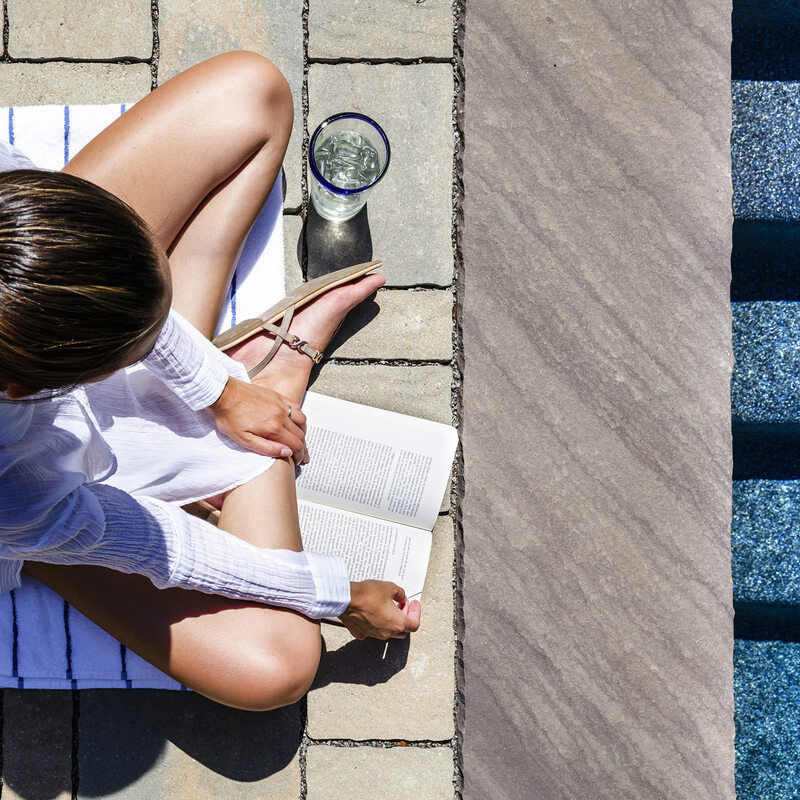 If tanning is more your speed, be sure to talk to your landscape designer about adding a tanning shelf, otherwise known as a Baja shelf, to the swimming pool. Tanning shelves are commonly about 6″ deep and built into one ledge of the pool. These shallow areas are perfect for tanning, playing with the kids or just straight up relaxing. As an added vacation feel, set your reclining chairs right in the water! The best of both worlds is being able to soak up the sun without overheating from the sun’s rays! Have you always wanted a swimming pool because you love to swim laps as exercise, but you feel that you don’t have the space or funds for a lap pool? Well, there are resistance systems available for residential pools for this exact purpose! Having a professional install resistance jets to your pool provides an “endless” current that you can swim against which promotes your family’s health and wellness, all within the comforts of your own backyard! After your water workout, you will need a way to just “be” and to relax those muscle groups you were just working out. Having a spa installed that is just nearby or connected to your swimming pool not only looks amazing, but has vast health benefits as well. The hydrotherapy provided by your spa provides the heat, buoyancy and massage factors that your body receives as a healing force. Spas and hot tubs are known to aid in the healing joint and muscle pain, can help regulate sleep patterns, and promotes relaxation to your otherwise busy and hectic life. 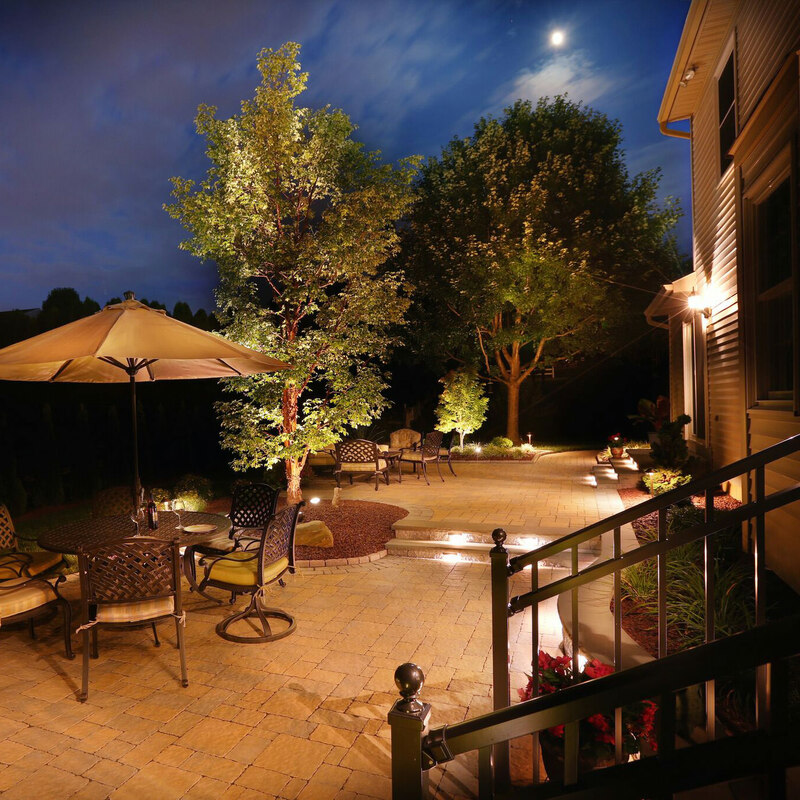 Once you have your pool materials, shape, position and amenities selected, don’t forget the factor that ties everything together…lighting! A well-lit pool area, inside and outside the water makes that much more of a theatrical impact. Illuminating the pool’s curves or showing off the deck jets spilling into the water create a lively feeling, brightening moods and encouraging togetherness. 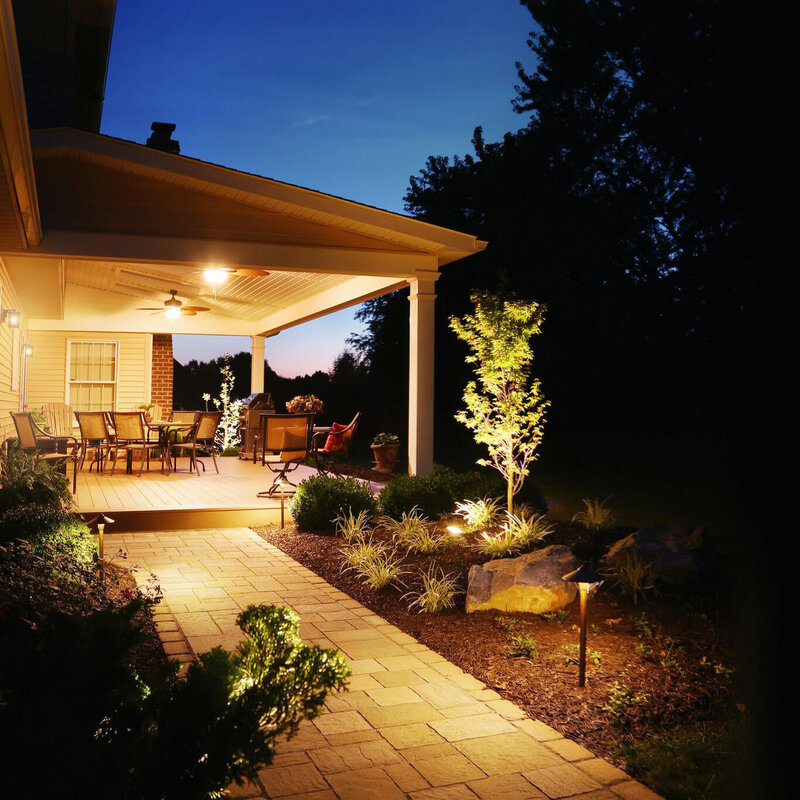 Warm LED lighting incorporated into your backyard staircases and along pathways makes for everyone’s entrance and exit to be safe with each illuminated step. When it comes to in-ground swimming pools, the truth is that the possibilities are limited only by our imaginations. Swimming pools nowadays can have grand elements such as grottoes and incorporated playgrounds to beautiful cascading waterfalls or a simple system of water jets to catch your attention. 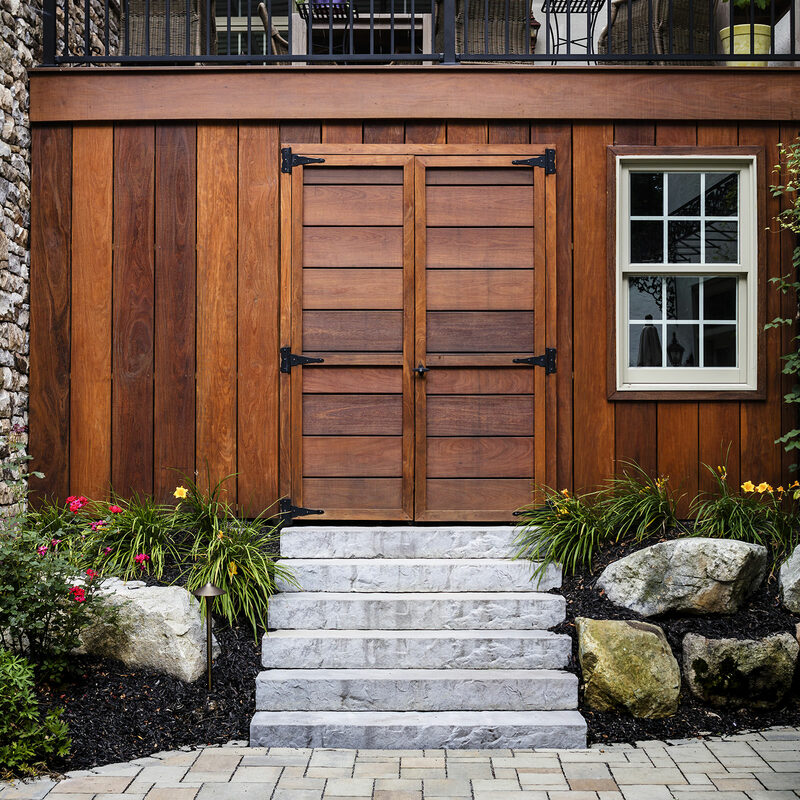 Whichever features you select to be a part of your backyard oasis, a professional(s) needs to be involved not only for the build process, but to make sure everything is code compliant and safe! 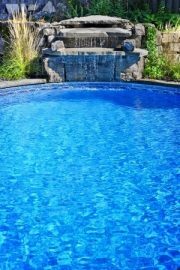 Your landscape designer will work in conjunction with a trusted and reputable pool builder, discussing your options so everyone can work in harmony on one main goal…your outdoor enjoyment! 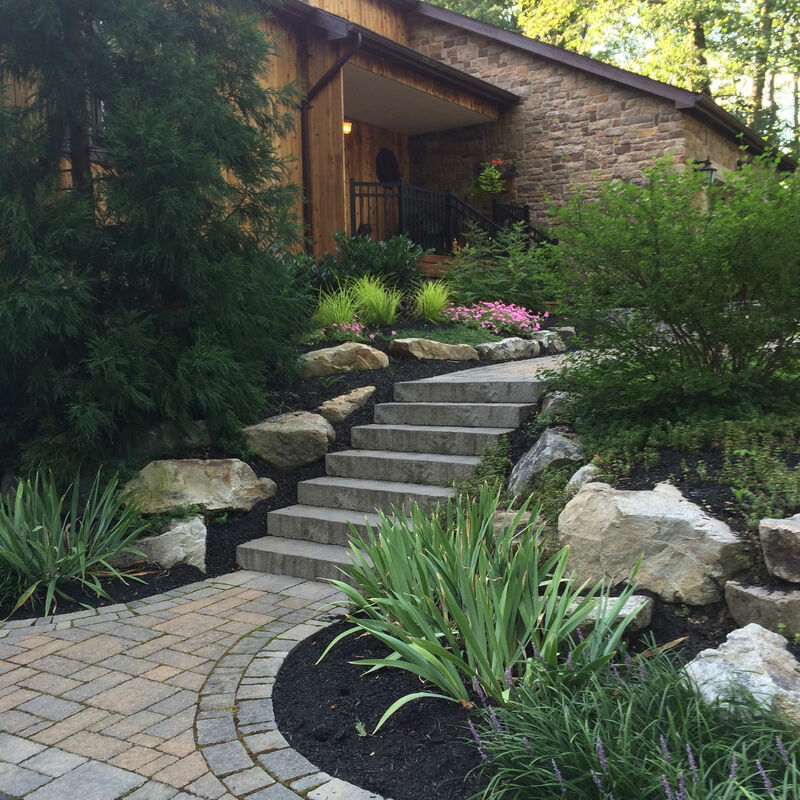 Reaching out to MasterPLAN Landscape Design is the first step in achieving all of your outdoor living space dreams. 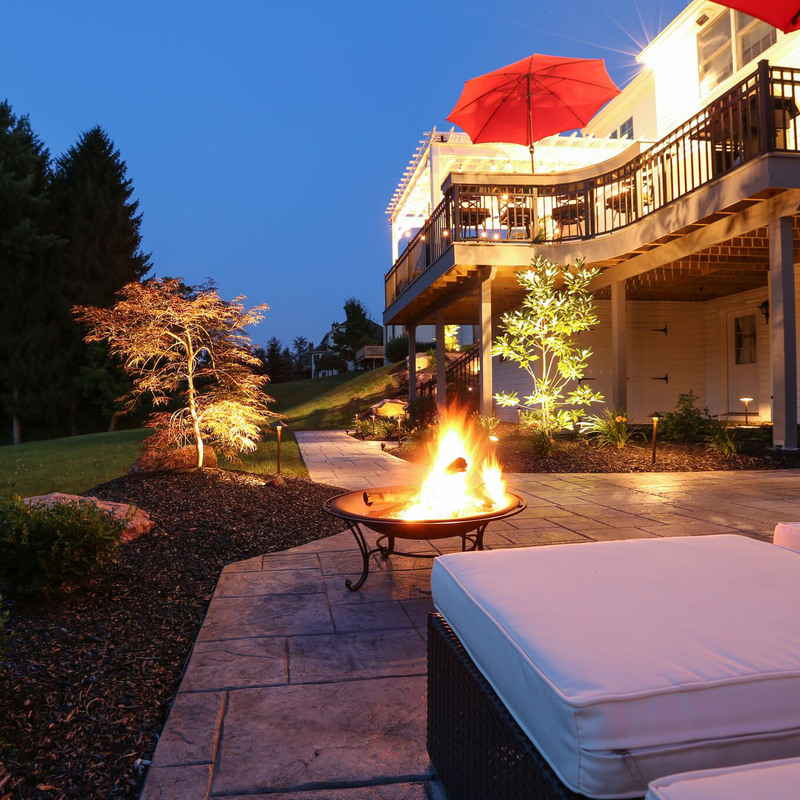 Backyard transformations are our specialty and being able to custom-tailor your backyard to suit you and your family is our passion! 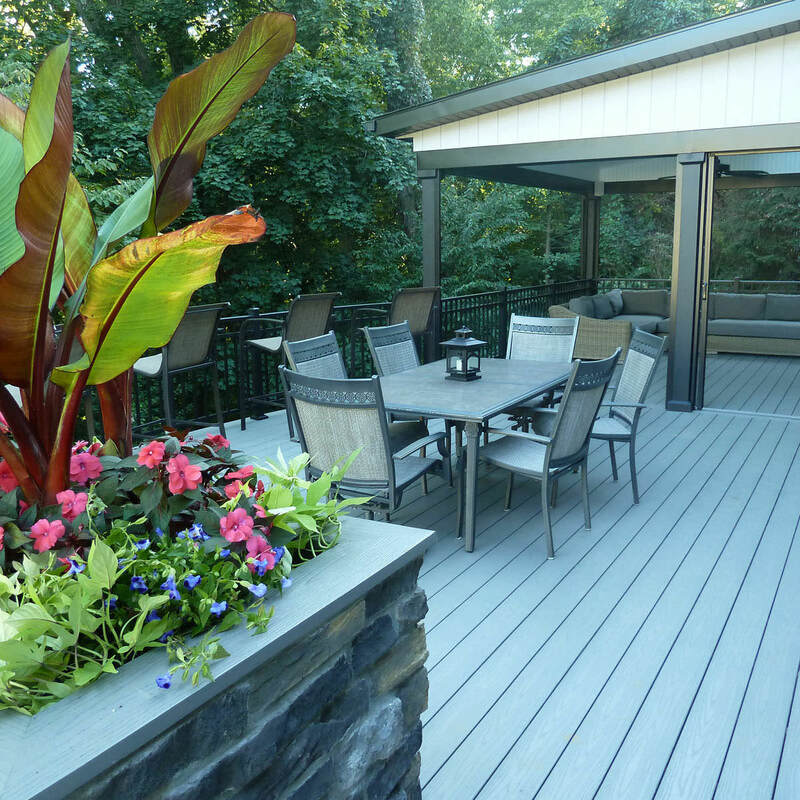 Contact MasterPLAN today to turn your backyard dreams into your reality!